Hola kitties! Do you ever feel like a tiger? Let's talk about this tiny tiger and noms. When I first moved here, I ate everything put in front of me. The cheapo supermarket brands I was served would make your fur stand on end. More importantly I wasn't served enough wet food and soon found myself dehydrated. Now I get premium cat food but the older I get; the more finicky I get. That's why TW said I needed my own restaurant so I founded Chez Keisha. TW was at the point where she was wondering if I should continue to review food. What good is having a restaurant if I can't taste new brands to serve to my diners? 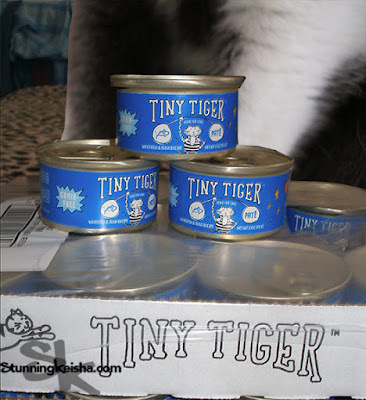 When she ordered the Tiny Tiger from Chewy.com, it was with the intention that I'd taste a few cans, write this review and share the rest with our homeless cat colonies that hang out in the hood. Like all good eating establishments, I donate leftover food to those less fortunate than myself. Um, slight change of plans but first let me tell you a bit about this new brand that seems to only be exclusive to Chewy. Tiny Tiger is committed to helping cats of all sizes make their biggest dreams come true. They provide grain-free wet cat food recipes that are made with real protein first with no grains, wheat, corn, soy or carrageenan. 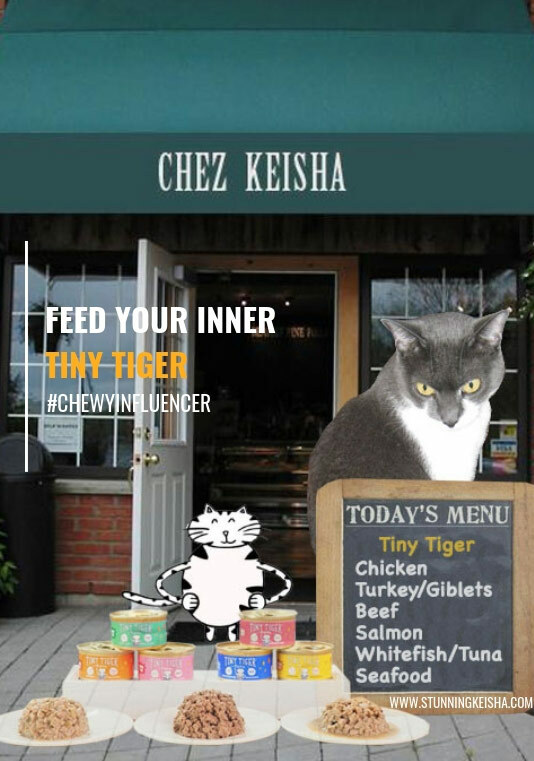 At Chez Keisha, we serve chicken wet cat food, turkey wet cat food, salmon wet cat food and many more crave-able recipes. Check out the menu list on the lead image. We ordered the whitefish and tuna. This high-protein cat food comes in three textures—nommy paté as well as wet cat food in gravy and extra gravy. This should please all my furrends. Each can of wet cat food contains the essential nutrients cats need to feel and look their best including taurine, omega-3 fatty acids and added vitamins and minerals. Plus, wet cat food is a healthy way to add daily hydration along with fresh water. To make sure I'm hydrated, TW adds a couple of teaspoons of water to my paté. 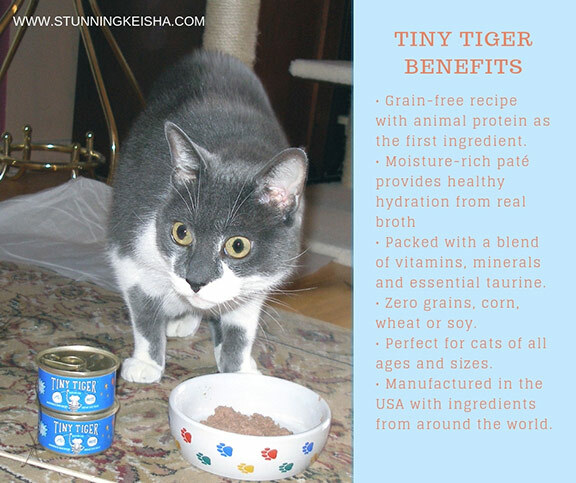 Tiny Tiger produces everything in the USA or Canada using high-quality ingredients sourced from around the world. Did the Tiny Tiger pass the CK taste test? Here's the proof. 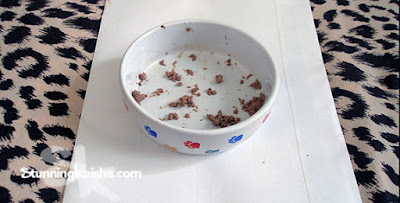 I never lick my bowl clean but even Pop would admit I did very good work, which means nada for the less-fortunate kitties living on the next block. I could change my mind at any time cos I'm wont to do that especially right after TW orders another case. You don't have to take my word for it cos when you place your first Tiny Tigers' order, Chewy will give you 50% off the first item*. So open up a can, bring on every pounce, prowl and purr, and feed the stripes within! Check out the Chewy Cat Shop for all the cat supplies your kitteh could ever need, want, dream about, purr over and claw for. You’ll find the entire Tiny Tiger cat food line as well as cat supplies ranging from food and treats to litter and toys, supplements, beds and so much more all at a discount. Don't forget that Chewy has great prices and the best customer service plus you save 5-10% on all autoships. Orders over $49 will get you free one- or two-day shipping. Tell 'em CK sent you. Word. That's awesome that you really liked this food, CK (well, at least for now). Oh does that sound good CK, excellent review! CK, we like to hear that you've nommed your food! We too add water to everyone's meals...even making things a bit soupy, oops! Way to go (mostly) clearing out your bowl, CK! 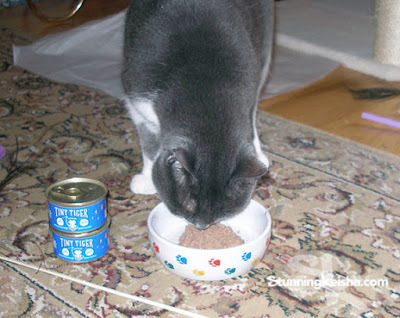 You know, none of us kitties here liked the Tiny Tiger canned food. But, if someone as stunning as you likes it, then maybe we should give it a second thought. Inner tiger? Now that sounds pretty good. Can dogs have an inner tiger. That looks and sounds a very good food. If it passed the CK test, then it must be good. Wow, that bowl does look pretty clean. This sounds like a good food to try and we'll tell Dad to check it out! Thanks for sharing! I've never heard of this brand. We hope you keep eating it (though we know kitties can change their minds in a second)! We really liked the Tiny Tiger too! MOL that's hard to say three times fast! Wow, I guess you liked it! That bowl is definitely proof!